Bradford - Travel by train - Bradford Interchange, Bridge Street, Bradford, BD1 1TU. Most services are provided by Northern Rail, with a few long-distance services from GNER. Bradford has two central train stations; Bradford Interchange and Bradford Forster Square. National Express East Coast runs fast, frequent passenger train services on the East Coast Main Line between London Kings Cross, the East Midlands, Yorkshire, the North East of England and Scotland. Customer Relations Tel: 08457 225 333. nationalexpresseastcoast.com. Also see Bradford tourist and travel information. In Bradford city centre, this Hilton hotel offers modern en suite rooms and secure parking. Bradford Interchange Train Station is a 2-minute walk from Hilton Bradford hotel. City 3 Restaurant offers international dining and views across to City Hall. City 3 Bar serves wine and coffee, along with a snack menu. The bedrooms at Hilton Bradford have work desks, tea/coffee facilities and TVs. Some rooms feature city views. There are limited free passes at a local gym for guests, less than a mile from Bradford Hilton. Within a 5-minute walk are Forster Square shopping centre and the National Media Museum. Only 400 metres from the very heart of Bradford, this traditional Yorkshire stone building has undergone a Â£450,000 refurbishment and now offers 22 comfortable and attractive en suite rooms. 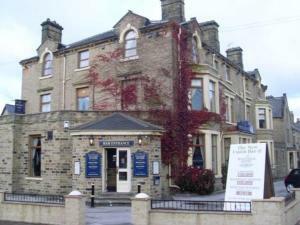 Built around 1900, the family-run Westleigh Hotel is situated just outside the heart of the city. The university is just a 3-minute walk away and the city's shops, bars, theatres and clubs are just 5 minutes' walk away. Situated far enough away from the city's vibrant nightlife to have a peaceful, quiet location, the hotel is nevertheless within easy walking distance of everything that Bradford has to offer. Leeds Bradford International Airport is just 25 minutes away and the train and coach stations are just a 3-minute taxi ride away. This city centre hotel offers offers opulent Victorian surroundings with modern day comforts. Magnificent public areas, spacious bedrooms and a central location make the Midland Hotel excellent value for the price. A stay in this hotel is a uniquely relaxing experience. Step back into the ambience of an era long gone, but with all the facilities of the 21st century including magnificent public areas, spacious bedrooms, opulent ballrooms, regular entertainment, an excellent English and continental restaurant, 24-hour room service and a residents' bar that never closes. The Midland Hotel has a number of designated smoking rooms on a separate corridor to the non-smoking rooms, all different types of room. Holiday Inn Express Bradford City Centre is located within the Leisure Exchange complex, which boasts a casino, ten pin bowling and various restaurants and bars. The rooms at this Holiday Inn Express are spacious and all have en suite facilities and opening windows. A hot breakfast buffet is served in the Great Room every morning. The hotel is 10 miles from Leeds Bradford International Airport and 12 miles from Leeds city centre. The main bus and rail stations are a short walk away.